£125 works out £12.50 per class. If you practise anywhere from once every fortnight to 2 classes a week, then this is the class card for you. PLEASE NOTE: This class card activates on date of purchase. Therefore your 6 months starts the day you buy NOT from your first class. 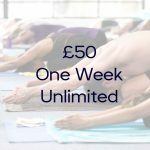 If you are making it to 10 classes a month have you thought about our 12 Month Autopay, at £99/month for unlimited yoga! There is a 2 month cancelation policy so if you need to cancel before the 12 months is up, just give your 2 months notice, practise as normal & your done!